This ooey-gooey campfire dessert has mini marshmallows, fruit, chocolate and peanut butter, all melted together in an ice cream cone. Campers of all ages will love stuffing their cones with sweets and fruits, then cooking them in the coals of the campfire. Start by laying out your cone stuffing. I used banana, raspberries, mini marshmallows, chocolate chips and blackberries. At the last minute I also popped in some tangerine wedges left over from a snack. Spread the inside of each cone with peanut butter (we like the crunchy variety). This is definitely optional if someone has nut allergies. Wrap a large piece of foil around each cone, leaving plenty of foil above the top edge of the cone. This will make it easier to seal the cones once they’re filled. Stuff the cones with your stuffing ingredients, making sure to use plenty of marshmallows. 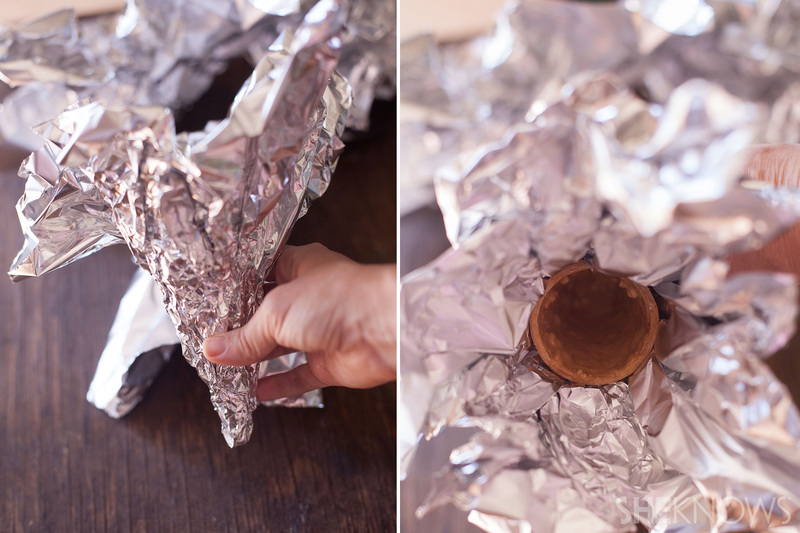 Fold the top edges of foil over the cone, sealing it well. Place the cones on the outer edges of the campfire, into the coals. If you place them directly into the fire, then the cones will burn before the marshmallows and chocolate melt. You can also place them onto a grate over the fire. Let them roast for about 5 minutes. Carefully (I use really long tongs) remove the cones from the fire. Unwrap one to check if the filling has melted. If not, then wrap it back up, and leave the cones in the coals for another few minutes. 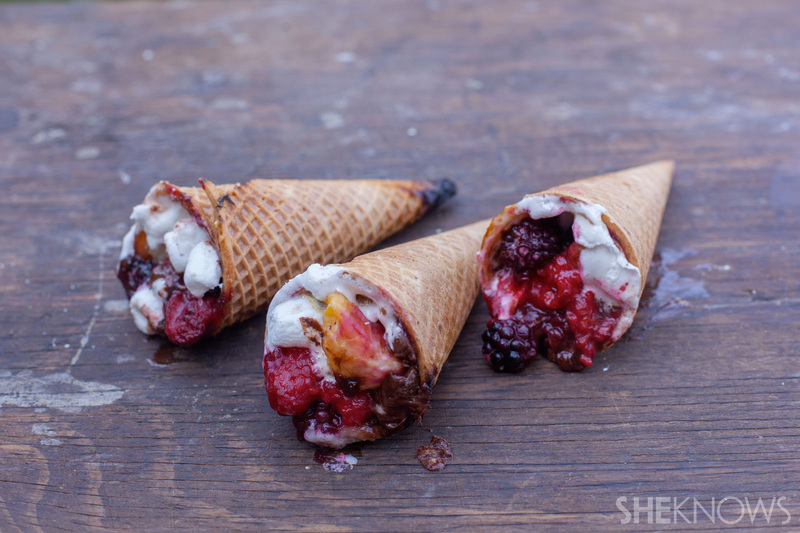 The cones are done when the marshmallows and chocolate are just melted and the fruit is soft. For younger campers, let the cones sit unwrapped for a few minutes before handing them over. The top layer of gooey marshmallow and chocolate will be completely cooled, and the layers underneath will continue to cool as the little ones eat their way down. Be prepared for things to get messy. Please remember to keep a close eye on kids around a campfire and to use safe practices for building and putting out your fire. If you want to make these at home but don’t have a fire pit, then simply cook them outside on the grill. Spread the inside of each cone with peanut butter. Wrap each cone in a large piece of foil, leaving plenty to wrap over the top of the cones once they’re stuffed. 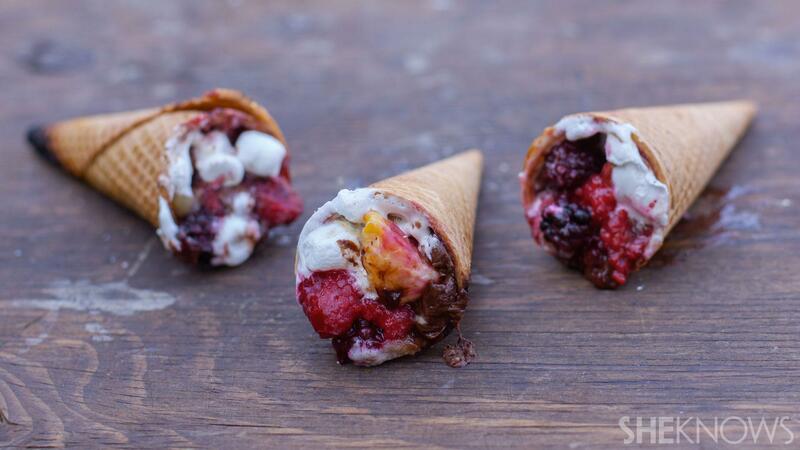 Fill each cone with pieces of banana, berries, marshmallows and chocolate chips. Make sure to use a lot of marshmallows at the top to hold everything together. Wrap the foil over the tops of the cones, sealing them well. Place the sealed cones along the outer edges of the fire, into the coals. Roast for about 5 minutes, until the marshmallows and chocolate are just melted.